The Cavan Burren is unique as there is not only an abundance of rock art in a small area but it is probably the only rock art in the Atlantic fringe which is to be found within an integrated landscape of settlement features and associated boulder monuments. This is the very thing that rock art specialists have found to be missing elsewhere. There is more… In addition to the rock art there is a newly discovered range of boulder monument types and a form of rock art, sculptings, also previously unknown to archaeologists. Rock art is recorded here at 25 new sites plus an additional 85 ‘sculpting’ rock art sites, all previously unrecorded. The table below shows 8 main categories of motifs – one of the most significant is the numerous examples of rosettes. 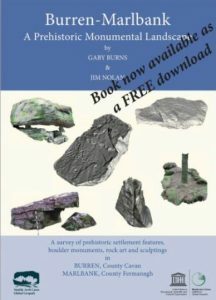 Sculptings is a form of rock art previously unknown to archaeologists. These can be verified by a variety of robust methods – evidence boulders, significant boulders, comparative evidence and finally by the vast number of examples occurring in complex combinations including their presence on boulder monuments. Nowhere else in Europe is there such a density of these examples. Yet their can be no doubt that they are to be found throughout – but as yet nobody is looking! The following are just some representative examples, of sculptings, out of the 80 plus in this area. See PB45-PB48 for the main geologically validated examples. 709 is a boulder with a complex of rock art – cup and rings and rosettes. These have been carved on a fresh face. It is interesting geologically that that the carving was across bedding planes and the subsequent weathering, on the sandstone, although noticeable, has not significantly reduced the motifs a useful guideline when comparing other carvings on similar rock types. PB23 is an evidence boulder as it has been split and both slabs remain in situ. There is a complex range of rock art on the main section, including rosettes, cups and rings. The other section has been deliberately propped and has sculptings. The two sections when refitted using 3D manipulation techniques clearly display worked sections on one face with corresponding section unworked. The refitting also reveals a recently identified sculpting feature type – ‘rounded corners’.